Akai’s long-awaited box of delights has finally arrived. From song-sketching and Ableton Live control to a versatile performance hub, is there nothing the Force can’t do? Despite the differences between hardware and software, there’s still room for something in-between the two worlds; hardware that provides a lot of what software offers, but doesn’t feel like a computer. We’re not talking about your dad’s groovebox, though. We want some 21st-century tech with our standalone piece of kit, and Force is the latest manifestation of this. 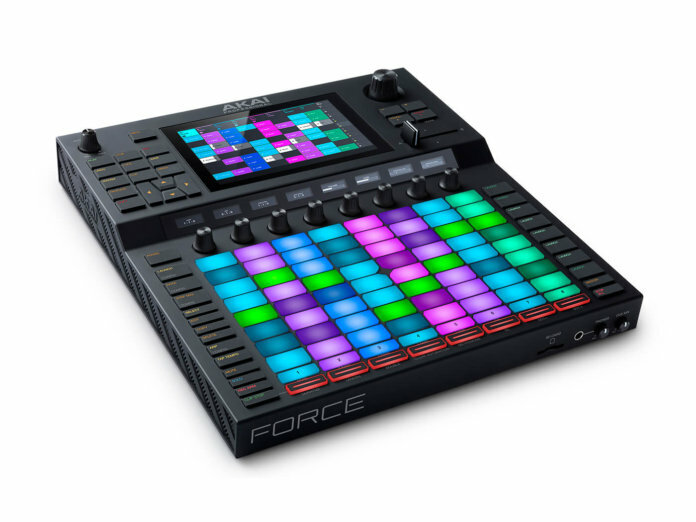 Akai’s Force is a standalone sampler, sequencer and effects processor with a display, lots of tactility, and plenty of connections to the outside world. It also connects to a computer and acts as a controller for Ableton Live, which gives it a unique hybrid status – like a toaster that also makes coffee. The package includes pre-installed content, a printed quick-start manual, power supply (this thing is way too chunky to run off a battery), three MIDI DIN-to-3.5mm jack adaptors and, more unusually, an ethernet cable. It’s physically imposing, weighing just over 3.87kg and measuring 350 x 389 x 72.5mm – definitely at the outer limit of being backpack-friendly. The Force is much better looking in reality than online – the standout features are the 6.9-inch touch display, 64 backlit RGB pads, and eight knobs aligned at an angle below the display. This combo makes it possible to view three sets of data at the same time. Alongside these main elements, there’s a large data entry dial, crossfader and a bunch of backlit buttons. The front edge hosts an SD slot, full-size headphone output, and knobs for headphone and cue volume. 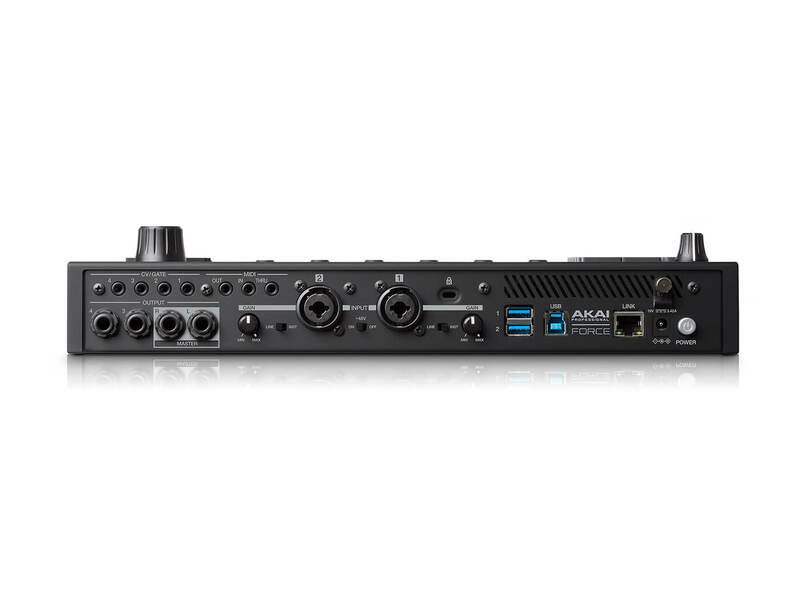 The rear panel features two 1/4-inch/XLR inputs with phantom power and switches for line/mic levels, two pairs of 1/4-inch stereo outputs, MIDI In/Out/Thru connections on 3.5mm jacks, and four CV/Gate outputs. This is rounded off by two USB-A ports for connecting a controller or storage, a USB-B port for computer connection and an ethernet port for that cable. And now, we need to talk about something that isn’t in the box – Ableton Live. Akai built Ableton’s Push controller, and this relationship shows in many aspects of the Force’s design. 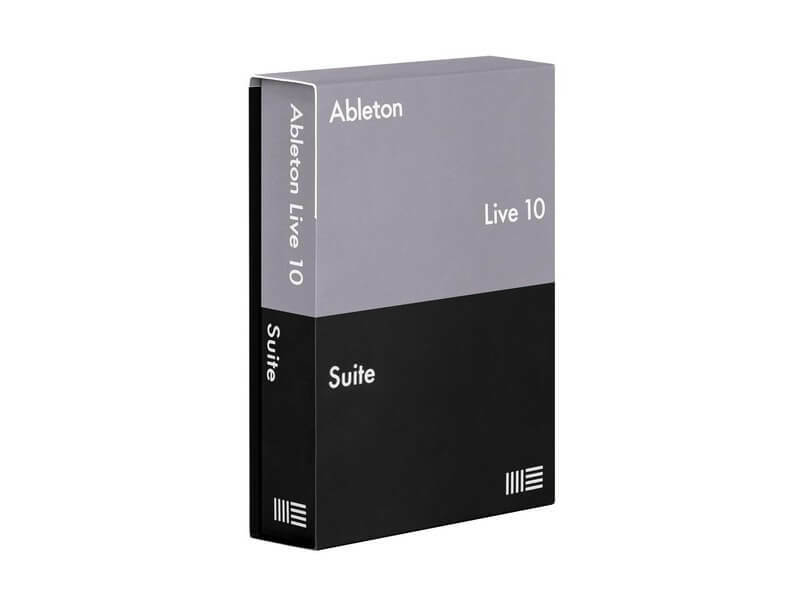 Over the years, many Live users have speculated on a hardware version of Live, but that’s never really materialised, so maybe it was inevitable that a company other than Ableton would take a shot. I could fill this review with questions and comparisons about Force versus Push/Live, but we should look beyond that and take the Force as it is. The Force enjoys the benefits of a fast hardware setup. Add headphones, switch it on, and a selection of demo projects pops up on the display – tap one to load it, then begin launching clips and scenes with the pads. The crossfader is even pre-assigned on a few of those demos as well. After that first jam, I found it helpful to consult the manual and check online for updates, which require either a USB connection to a computer or USB drive. Once it’s connected to your WiFi network, you can sync with other software and hardware via Ableton Link, although if you’re touchy about relying on WiFi for big gigs, use the Link ethernet connection instead. Furthermore, if you have an account with Splice, you can log in and sync your samples from there as well; it shows up in the Force browser just like any other source. The Bluetooth connection doesn’t support audio devices, but it works with MIDI devices and wireless computer keyboards (wired USB ones work, too). After being inspired by the demo projects, I wanted to use my own material. The Force has 16GB of built-in storage and 2GB of RAM. Underneath the device lurks a hatch for installing HDD or SSD storage, vastly expanding the device’s standalone status. Furthermore, the ability to stream direct from an external hard drive will be added shortly, which will be a big plus for heavy samplists. Still on the subject of capacity, the Force provides only eight tracks of stereo audio, but it will handle up to 128 tracks in total, with up to eight plug-in instrument tracks. The rest consists of sampler tracks for drums, keygroups and MIDI/CV tracks for external sequencing, with no restriction on the number of plug-ins used, other than the processing limitations of the CPU. Even though the Force functions as a self-contained entity, the MIDI and CV tracks are important because most of us have other external noise-making gear. For that reason, it’s a shame that the Force doesn’t have two more inputs, so it can receive audio from multiple bits of outboard. Quality and selection of onboard instruments and effects are critical in a closed system. The Force provides a collection of AIR instruments and AIR/Akai effects. These include reverbs, delays, bit crushers, compressors, sidechaining and more. The sheer number of available effects slots counters any feeling of being locked in, with up to four inserts per track and four return tracks. If you’re using a drum kit, there are four inserts plus built-in effects for each pad. There are also master-track effects and EQ, while the XYFX touch-effect interface makes things all the more interactive. If you want mod/pitch wheels, though, you’ll have to connect a MIDI keyboard. There’s also Vintage Mode, which presents an option to emulate output audio characteristics based on Akai’s previous hardware, such as the MPC3000 and MPC60, available either globally or on individual tracks. There are four instruments available: the Bassline mono synth, the Electric piano instrument, the Hype synth (combining wavetable, FM, analogue, and sample-based synthesis) and TubeSynth for analogue-style polysynths (based on the AIR Instruments Vacuum Pro). Having four instruments might sound limiting, but there is a tonne of presets to use to spark your own ideas. Some of these also make use of the pads’ velocity responsiveness to add a more organic quality, and Akai will release more collections of presets in the future. Let’s not forget that sampling is a major element of this machine, and its instruments could be seen as complementary to that. Parameter changes can be recorded as automation, which is great, although it’s currently not possible to view the automation afterwards. However, it can be edited in the massively useful and delightfully old-school List View. The pads are sensitive and perfectly up to the job. They’re in-between something like those on a Push 2, which are optimised for pure instrument input, and Akai’s own MPC Live, whose tasty black rubber pads are clearly more focused on percussion. Pad layouts reflect the type of track that’s currently active, and within that, there are options such as splitting the grid, so the top four rows provide clip and scene launching while the lower four play notes. In Melodic Note mode, it’s possible to choose a scale, stay in Chromatic mode or use the Harmonisation, Chord or Progression modes; in the latter mode, each pad plays a chord in a selected progression, which is very cool. I also like the simplicity of Piano mode, which uses the pads to represent the rows of black and white keys on a piano, covering four octaves. Whether I’m recording, sequencing or finger-drawing MIDI parts, the display handles note editing, quantisation, humanisation and more. What’s quite fun is combining the Generate Random Events function with the Pitch Quantize command, creating random beats and sequences then forcing them into key. It’s not as speedy as using a DAW, but that’s part of the standalone magic! 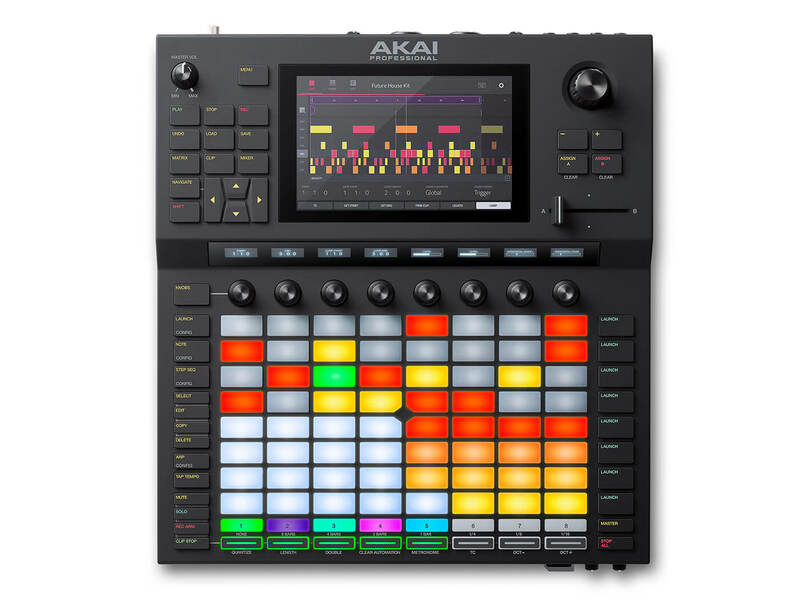 Of course, the Force is an Akai sampler. Sample import, recording, warping, key groups, looping, slicing… it’s all here. Once I got the muscle memory down, it was fast to work with. The chop function, in particular, is a fast way to distribute a sliced sample across pads, making it immediately ready to play. Wherever sampling leads, file-management issues follow. There’s a search function, the option to audition samples at their native tempo, or warped and sync’d to the project. There’s additionally a handy system-resources view, which shows CPU, RAM and storage status. It’s also very easy to purge unwanted samples if you need a clearout. Loading in a few DAW-built music projects into the Force for real-world experience (with stems from a song featuring a drum machine, guitars and vocals), I had no problems getting them to start and play in sync, and it’s easy to add extra beats programmed on the Force. Next, I tried some different microphones and found no issues in getting a loud and clean signal. It’s the same when I plugged a guitar in direct. There are no guitar-specific effects onboard, but it’s possible to get a usable sound with the other types of effects on the Force. Next, I loaded an electronic, drone-type project, and ended up rebuilding virtually the whole thing using the onboard instruments and imported drum samples. I configured the knobs for this one as well, and ended up with a very interactive synth-plus-effect setup. The BPM is saved with each project, but strangely, I couldn’t see any way of changing from 4/4 time – not something I do very often, I’ll admit, but this will be critical for some users. I love randomisation, so probably the biggest fun I’ve had with the Force involves going into an empty project and using the Generate Random Events command to create beats and instrument patterns, along with the Filter Note Values function to keep everything in key. Very nice. After creating MIDI parts and organising my samples, it was time to jam with clips and scenes. The Force provides extensive control over clip behaviour, with trigger and toggle launch modes, legato clip launching (where one plays neatly into the next according to your defined start points), looping behaviours, clip splitting, and muting sections of a clip. Clips can be launched by the pads themselves or by pressing the Matrix button and tapping the display. This keeps the pads free for more note entry. It’s possible to constantly reorganise your POV while playing, bringing up mixer, MIDI editor, matrix, note mode, macros or whatever is required on the knobs. It’s very fast and intuitive to work with. Issues of computer versus hardware fade away, and the focus is squarely on the fun and creativity of making and performing music. It’s easy to create a Link setup, with the Force syncing over WiFi to Ableton Live 10 on a Mac, and sending MIDI out via the rear port to an Arturia DrumBrute. Although it’s now common practice with music gear to use small jacks with adaptors, it’s a shame something as big as this still can’t accommodate full-size MIDI ports. Nevertheless, they do work. Currently, the Force doesn’t support Link Start/Stop, so it’s purely a matter of jumping in and out of the ‘stream’ while maintaining sync. For any DJ reading this, the Force can sync with Serato via Link as well, and even with Pioneer’s own Pro DJ Link protocol, via an application called Beat Link Trigger running on a computer. Frustratingly, there’s no way to create a full arrangement inside the Force, so it falters at that last part of the process. However, an Arrangement mode is said to be on the way. It has also been confirmed that Ableton Live integration is coming soon, which will be a big plus for many users. Force projects will be exportable as .als files, so they can be opened directly into Live on a Mac or PC. Additionally, Force will act as a Push-style controller for Live on a connected computer, going as far as to show Live’s interface on the touch display. This integration will add huge value to Force and make it even more adaptable to any studio or live situation. The Force is so enjoyable to use – I’d happily put it to work for song sketching, sampling, jamming and live sets. 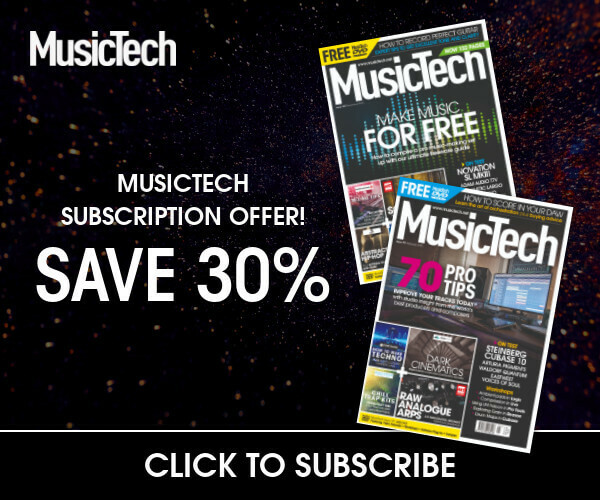 It’s a great prospect for anybody interested in creating or performing with music hardware. Even if you’re a software diehard, this is another way to think about presenting live music, especially if you experience the occasional option paralysis that comes bundled free with every DAW. It’s newbie-friendly as well as pleasingly familiar to experienced users, and can lead an entirely self-contained existence (more so when the arrangement mode update is available), or integrate into a setup with other gear. The Force wears its design influences on its sleeve, but that’s okay – no product pops into existence fully formed. Force is already a serious proposition, and with the imminent Live integration, this could be the perfect hybrid machine. If you’re already rocking a laptop, some DAW software and a controller that you’re happy with, maybe you don’t need this. But you still might be attracted by the self-contained nature of the Force. There is something to be said for a single-box solution, and frankly, this is something that, if a DAW maker had created it, its user base would be all over. One box, one case, one mains plug, nice and easy. Use it like that, separated from other instruments, or take advantage of the comprehensive connectivity to integrate with the outside world. It’s limited in scope and expensive, but sometimes, it’s really good for your head to work with hardware that is totally focused on music and doesn’t distract you with notifications. This is an obvious one to include, due to Akai’s history of building products for Ableton, and the undeniable influence on the Force design. Live is an accessible but far-reaching creative and performance tool, although the price of admission is high if you want the fully featured Suite version. 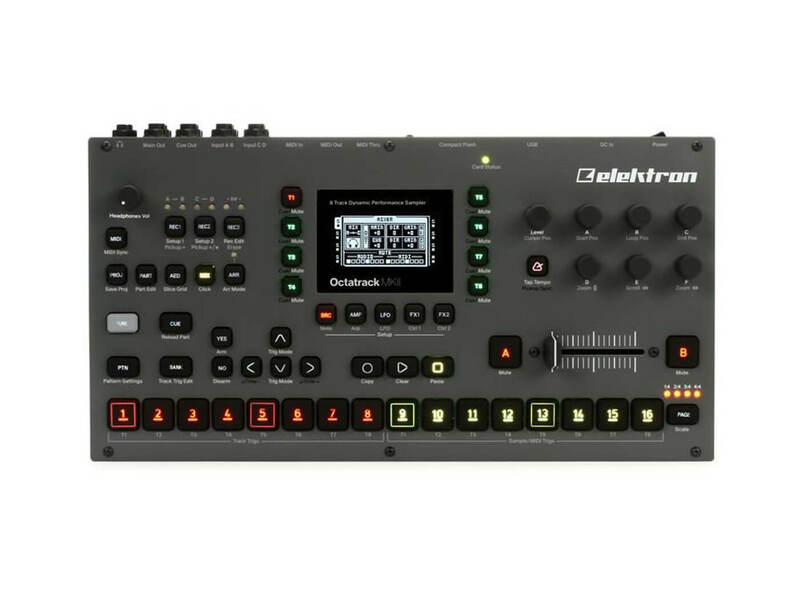 The Octatrack, currently on its second version, is one of Elektron’s flagship boxes. This is a sampler and sequencer only; there are no onboard instruments, just a set of very cool audio effects. It’s great for playing very long samples. Look out for the retro CF card, and generous connectivity. The Force is a powerful sketchpad/delivery system and Live controller. The price demands some commitment, but it reflects the features at hand, and it’s an absolute blast to use.